Backup the existing web application directory (%TOMCAT%/webapps/kinetic). Login to a machine that has cqlsh installed and has access to the cassandra cluster you are upgrading. Run the schema.cql file with the cqlsh program: cqlsh -e "SOURCE '/full/path/to/schema.cql';"
This release requires Database Schema changes. Ensure you download the Database Schema file from the releases page before continuing. Once the steps outlined in the General Upgrade Instructions have been completed, no specific post-upgrade steps are required. Once the steps outlined in the General Upgrade Instructions have been completed, please review the steps below as they may be applicable to your implementation. 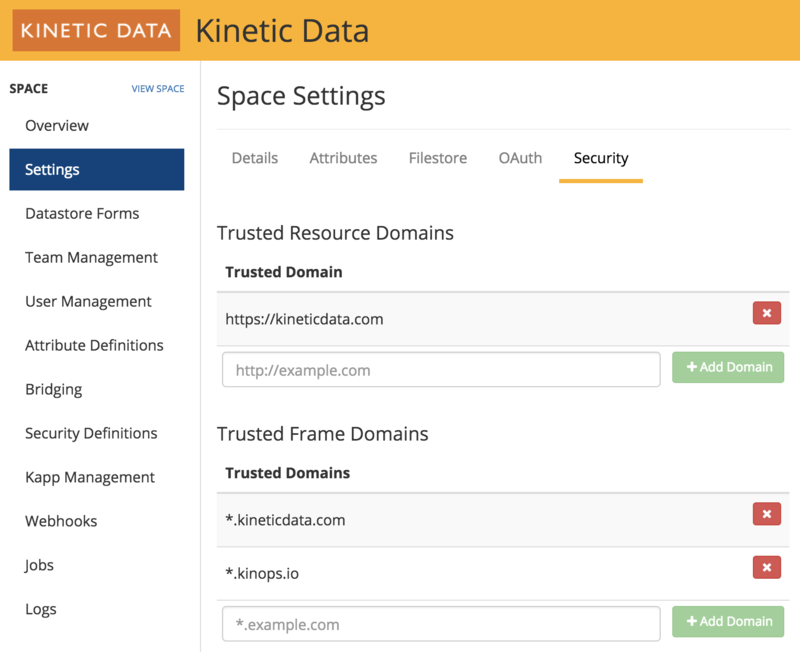 If your implementation is relying on embedding iFrames to Request CE from a different domain (ie, https://www.acme.com has an iFrame that is displaying https://acme.com/kinetic/acme/catalog/ipad-request), you will need to add a Trusted Frame Domain for each of the trusted domains (ie https://www.acme.com). If your implementation is relying on making AJAX calls to Request CE from a different domain (ie https://www.acme.com has a custom HTML form that POSTs data to the Request CE API at https://acme.com/kinetic/acme/app/api/v1/kapps/catalog/forms/ipad-request), you will need to add a Trusted Resource Domain for each of the trusted domains (ie https://www.acme.com). If you are using a legacy bundle (ie one that defines pages in JSP pages instead of React) that has an HTML form that makes a non-AJAX PUT, POST, or DELETE, you will need to add a CSRF token field. Most of the bundles provided by Kinetic Data will already have the CSRF token included (such as for the login.jsp or the resetPassword.jsp). "Invalid CSRF Token 'null' was found on the request parameter '_csrf' or header 'X-XSRF-TOKEN'." If you are upgrading from a version before v2.1.0, please follow the 2.1.0 Upgrade Instructions before proceeding as that version included Database Schema changes which need to be made. If you are upgrading from a version before v2.0.2, please follow the 2.0.2 Upgrade Instructions before proceeding as that version included Database Schema changes which need to be made.